Ceiling fan installation is one of the effective and affordable ways to improve your home. Either you’re in front of a serious renovation project or just to want to add a couple of fresh touches to your place, improving illumination and enhancing micro-climate with one of the best ceiling fans with lights definitely worth investing in, especially if that can be done by such a simple budget-friendly solution. Since the modern market offers a huge choice of ceiling fans with integrated lights, this sort of makeover can be your inexhaustible source of inspiration for your DIY home remodeling ideas. You can now replace some of the outdated and unattractive light fixtures at home as well as solve the problem of insufficient light as well as improve the airflow to move your home amenities to a new level of comfort. Despite its small size, the highly technological Minka-Aire provides an ample illumination due to the 100 watts halogen element which is optional and can be replaced by a specially designed cap if not needed. It’s an ideal solution for medium-sized spaces and a great option for low ceilings. 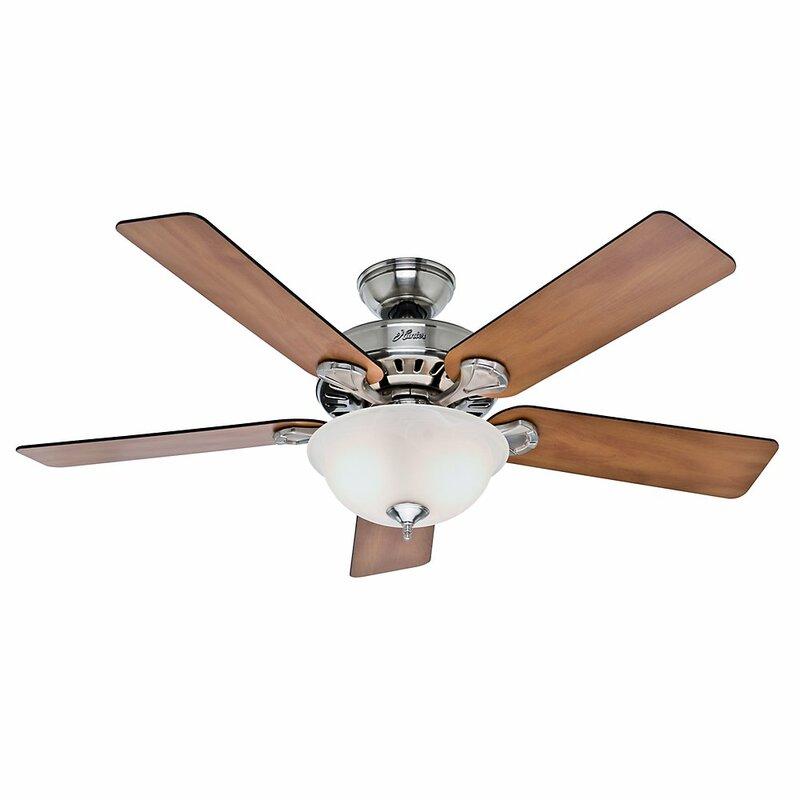 The model is one of the best ceiling fans with lights also because it comes with a unique remote control system with a reverse switch for year-round use. Numerous positive reviews demonstrate the obvious advantages of this fan such as contemporary design, quick and easy installation, and an extremely noiseless performance. For many users, this model is a rewarding combination of functionality, comfort, and modern elegance. The dimmer system is quite simple. The light is not extremely powerful but it can still provide enough light for basic use. Although the model has been initially designed for low ceiling use, there’s plenty of evidence stating it’s quite effective for higher ceilings as well. If you want to create a comfortable environment for larger areas (up to 360 square feet) or simply need to install a fan on a high ceiling, the impressive 6254 cubic feet per minute produced by this Westinghouse model will have no problems to cope with the task. In addition, its centered light source will provide ambient illumination powerful enough to allow basic activities. One of the key features making this model one of the best ceiling fans with lights is its power saving (consumes only 63 watts excluding the light kit) resulting in an amazing airflow efficiency of 113 cubic feet per watt. This item got plenty of positive feedback from users due to its famous brand and was highly rated because of impressively quiet operation, a sleek design, and a very competitive price. Many customers enjoy using this fan in their patios and porches since it’s powerful enough to be installed outside too. This great model by a renowned brand offers homeowners a 90 percent pre-assembled ceiling fan which can be installed in no time. Such a great feature has become especially popular among DIYers since it requires simplest operations to be mounted on any surface. Besides, the model’s five blades produce an impressive airflow enough to create comfortable surroundings in a 400 square feet area. 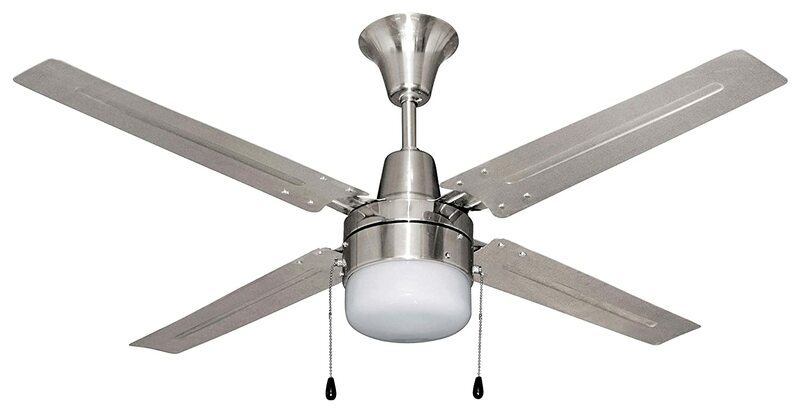 A lot of users have opted for this model as one of best ceiling fans with lights due to its unique anti-vibration system which makes the fan a really wobble-free device. The fan comes with power-saving fluorescent CF bulbs. Although it takes a couple of minutes for them to get to full brightness, once they’re there, they provide enough light for everyday routines. Besides, one can always switch for incandescent elements, though the carbon footprint, in this case, will be considerably bigger. This is also one of the best ceiling fans for bedrooms. With the airflow of almost 3500 cubic feet per minute, this 4-blade ceiling fan made of brushed chrome with an integrated 60 watts single candelabra is a nice choice for smaller areas. The 19-inch distance from ceiling to blade means Litex can be used on low ceilings. However, its greatest advantage that has made the model popular among many users is its 15-year limited warranty which many perceive as the quality certificate. Those seeking for the best ceiling fans with lights have chosen this model since it’s simple, affordable, and nice looking. Many users find its design quite innovative and industrial while its quiet circulation allows installing it in bedrooms and rooms for kids. According to many reviewers, the fan is a good value for the money and is a good choice for those who’re on the budget. The combination of affordability and performance is really rewarding in this model. The amazing 6 ½’’ height from ceiling to the blade make this 14-degree blade pitch model worth considering for areas with low ceilings. The light kit contains two 60 watt bulbs which are hidden behind a nicely decorated frosted glass cap and are able to produce quite a lot of light. Normally, the fan is operated by pull chains, however, there’s an option to buy a wall control unit additionally. Like the majority of best ceiling fans with lights, this model is made of quality materials and can provide good illumination. A lot of reviewers note an exceptional design and a fabulous look of the fan which make it a real eye-catcher in any surrounding. Besides, it’s quite lightweight (only 22 lbs.) which makes the installation easy and trouble-free. Although the price for this fan tag is quite impressive, many consider it being worth the investment. Although it may sometimes be difficult to inspect or evaluate the quality of the materials used for the capacitor or the motor, you can still check factors like noise and wobbles. Fans with low-quality motors which cannot provide enough power to move much air will probably be equipped with horizontal blades or have minimum blade pitch not to put too much load on the motor. Don’t forget to pay your attention to the light fixture. Make sure the light diffuser secures enough space for light bulbs and check that it isn’t made of cheap plastic that can melt or burn with time. The first thing to look for when searching for the best ceiling fans with lights is how much air it can move. This is normally estimated in cubic feet per minute (CFM) and may range from 4000-5000 (good) to over 6000 (best) in ceiling fans designed for domestic use. However, performance is not the only factor to base your decision on since it’s normally influenced by room size and the ceiling height. In other words, choosing a fan with the highest performance is not always the best solution. On the Web, you can find CFM ratings and calculations to buy a quality fan that would fit you best. Since your ceiling fan will be consuming electricity both for breeze and illumination, it’s worth considering a model that would be power-efficient. A lot of contemporary models are equipped with power-saving LED elements as well as offer several operational modes to reduce electricity consumption. Some ceiling fans can be remotely controlled by smart apps which help to save power too. In order to choose the best ceiling fans with lights make sure you check the wattage of the fans and their light fixtures. 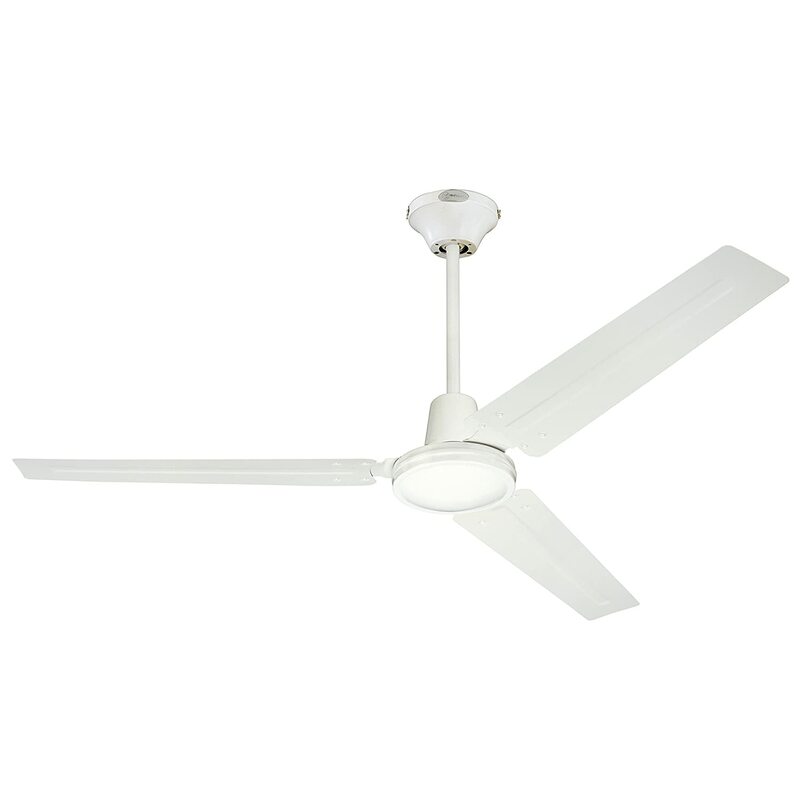 A ceiling fan with light will consume more than the one without a light fixture. So, if you’re planning to increase the amount of light in a certain area of your home by adding a couple of electric appliances, be ready to pay a higher electricity bill in the end of a month. However, if you use your new purchase to replace the old light fixture, you may even save a few pennies if you opt for one of best ceiling fans with lights equipped with highly-efficient LED elements. Since a ceiling fan is not allowed to be installed lower than 7feet to the floor, the lighting it will produce will never be enough for close-up activities. On the other hand, if providing a light source for your DIY projects is not your main goal, a ceiling fan can be just enough. Blades, as well as light diffusers, will inevitably attract grime. This means, your cleaning routines will become more complicated due to an additional place to take care of. On the upside, you can now choose a ceiling fan with some dust-repellent coating preventing dirt piling up on the surfaces. While there are numerous ways of home improvement, choosing the most successful strategy may be quite a daunting task. However, things get much easier if you know exactly how you’d like your place to look. While the majority of cheap fixes and simple upgrades won’t necessarily boost the value of your home, that’s surely not the case when it comes to ceiling fans with lights. This cheap and quick strategy allows sprucing up your place without a serious damage to your budget.